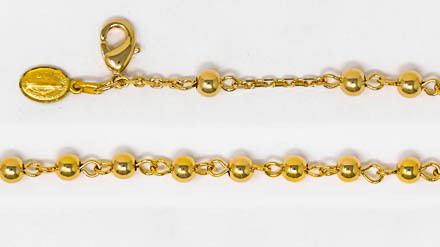 DIRECT FROM LOURDES - Miraculous Medal Rosary Bracelet with 10 Beads 18 Carat Gold Plated. Miraculous Medal Rosary Bracelet with 10 Beads 18 Carat Gold Plated. Miraculous medal 18 carat gold plated rosary bracelet with a Miraculous Medal Pendant and 10 Beads. The medal depicting the blessed Virgin Mary on the front and the traditional "M" surmounted by a cross, with hearts and stars. Measures 19 cm long 190 mm.